Another storm system is moving into Kern County tonight. Experts say this storm is expected to bring heavy rain, high winds and possible flooding. Experts give advice on how you can stay prepared. BAKERSFIELD, CA. — Another storm will make its way into Kern County Wednesday night and is expected to bring strong winds and heavy rain. This is the final storm in a series of storms that have impacted the county this week. Officials say they expect this storm to be the strongest and anticipate rain picking up late Wednesday night through early Thursday morning. "The major concerns are going to be rainfall, which will lead to flooding. We are worried about mudslides especially near burn areas," said Jim Andersen, Meteorologist with the National Weather Service. 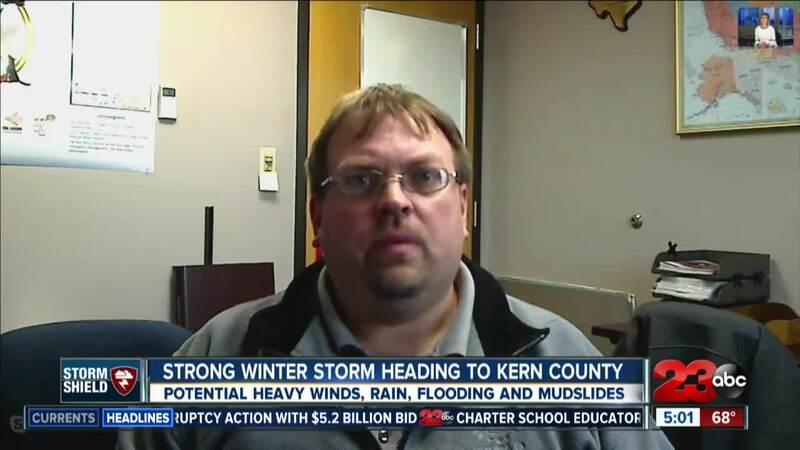 The Kern County Mountains could see the biggest impact with this storm and the most rainfall, according to Andersen. Although snow is not expected on the Grapevine or at pass level, more rain in communities already impacted by snow could trigger flooding. "When the rainfall falls on that snow, that snow is going to melt. That could cause floods for people downhill," said Andersen. Experts advise people to be cautious while driving if there is flooding on the roadways. "Don't cross water if it is six inches or deeper. Don't try to drive across water that is one foot deep because these things can sweep you or people away," said Andrew Freeborn with the Kern County Fire Department. Experts advise putting together a to-go bag in your home and car as preparation for a storm or other emergencies. 'Ready Kern', the mass notification system here in Kern County allows officials to send out emergency messages. For more information about how to sign up, click here.